This stained glass and stone mosaic is a BIG piece of artwork. The largest piece I have made to date. It was made in two sections and joined on sight, making the final alterations and additions once the two were joined. It really stops people in their tracks and "Wows" the viewer. 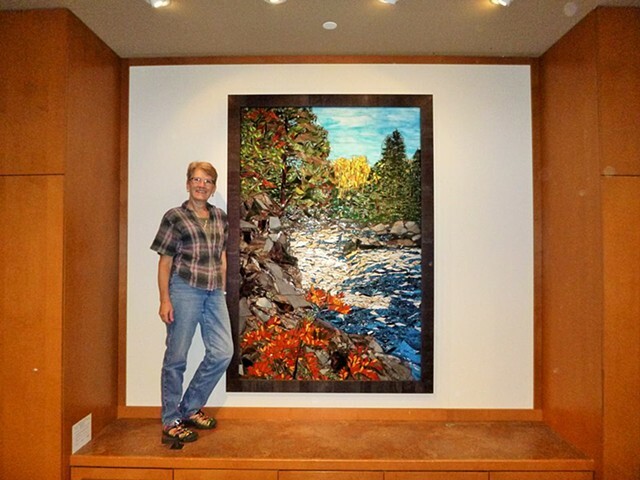 Again the north-shore area of Minnesota was the inspiration, it's beauty influenced the beautiful colors, resulting in a wonderful piece of artwork. Yes, that's me standing next to the mosaic to give an idea of the scale. 72 " x 48 "